faïence: Glazed earthenware such as Quimper. The name faience or faïence is simply the French name for the northern Italian town of Faenza, where painted majolica (or maiolica) was produced for export during the Renaissance. fausse paire: A pair of chairs, identical in form, that were crafted in different periods; typically, one of the chairs was constructed in the 18th century while the other was added in the 19th century to complete the pair. 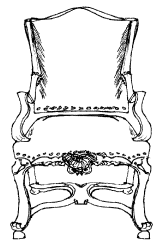 fauteuil: One of the most common styles of French chairs. An upholstered armchair with open sides that came into popularity under the reign of Louis XIV. Eventually, upholstered pads were added to the top of the fauteuil armrests for even greater comfort. festoon: A string or garland, as of leaves or flowers, suspended in a loop or curve between two points. finial: Decorative detail that is carved or shaped to ornament the top of an upright piece of furniture. flambeau: Decorative element resembling a flaming torch. A large ornamental candlestick. Literally, "a little flame." fleur-de-lis: A stylized lily or iris flower, used by the French kings as far back as the 12th century as a decorative motif symbolizing royalty. It is said to signify perfection, light and life. floret: A round, flower-like ornamental motif. fluting: Decoration formed by making parallel, concave grooves. In classical architecture they are commonly seen on column shafts and run in a vertical direction. Used on furniture since the 16th century. Francis I: A monarch of the House of Valois who ruled as king of France from 1515 until his death in 1547. Francis was an enthusiastic patron of the arts and initiated the French Renaissance. He attracted many Italian artists to help build the Châteaus of Blois, Chambord and Fontainebleau. In them, the Renaissance had its greatest French expression. 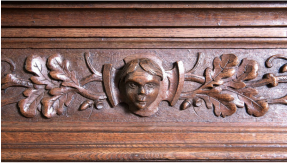 Walnut and oak were the favored woods, which were rich and profusely carved or inlaid. At the time of his accession, the royal palaces of France were decorated with only a scattering of great paintings, and not a single sculpture. During Francis' reign, he acquired the Mona Lisa from Leonardo da Vinci and actively collected artistic works by Raphael, Michelangelo and Titian, which were the beginning of the magnificent art collection of the French kings on display today in the Louvre in Paris. French polish: Process of finishing wood with a high gloss by applying successive films of shellac and spirits. French Provincial: A style of furniture, architecture, or fabric originating in or characteristic of the 17th and 18th century French provinces. Rustic, more simple versions of formal French furnishings of the Louis XIV and Louis XV styles, made in the provinces, as opposed to the furniture made for the King and his court in Paris. Craftsmen in the French provinces used local woods and natural, floral or toile upholstery. Court fashions often took a while to filter to the provinces, and as a result, French provincial furniture displays an array of overlapping styles. Most notable are pieces showing the influence of the countryside – ladder back chairs with woven rush seats and simplified carving representing wheat sheaves and foliage, and huge armoires which are fully knockdown and held together with chunky, hand made wooden pegs. Lavender, butter yellow, and blue are common colors in the French Provincial palette, influenced by the lavender fields, bright sun and sea in Southern France. fresco: A painting done on plaster before it dries, generally in mural decoration. fretwork: Elaborate form of pierced decoration used to adorn furniture and architecture that is either carved in low relief on a solid background, or cut out with a fret saw, coping saw, jig saw or scroll saw. Most fretwork patterns are geometric in design. frieze: Decorative or narrative composition in a horizontal band beneath the crown of a building or on a piece of furniture.